Experiential marketing budgets continue to rise, which means the opportunity to create epic brand experiences has never been better. As agencies get more creative with their tactics and the availability of technological advances they can incorporate increases, the uses for trailers in experiential remain as trustworthy and versatile as ever. The first thought many account managers have when they hear the term ‘marketing trailer’ is mobile tour. If I don’t have a client with a big mobile tour on the horizon, they think, why would I need a marketing trailer? But any good marketer should consider all options at his or her disposal. There are many ways a trailer can be put to use for your client to drive engagement and brand awareness. 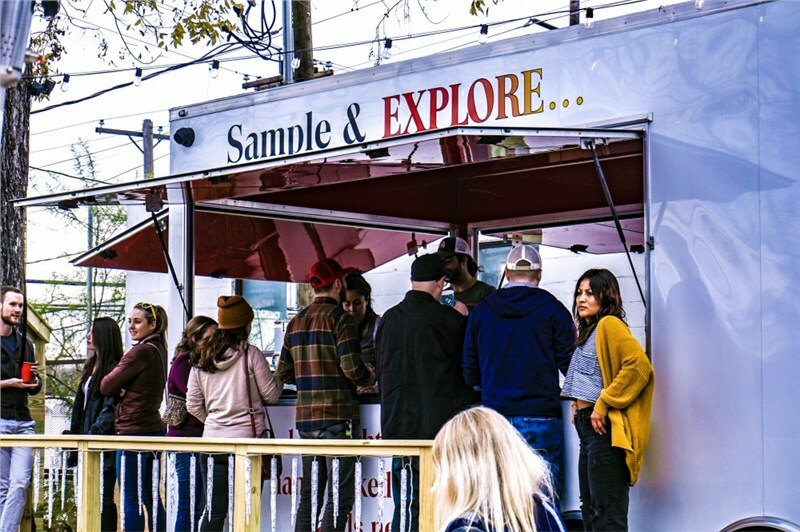 In fact, here are 10 great uses for a mobile event marketing trailer. I’ll get the most obvious one out of the way right off the bat. If you have a mobile sampling tour – especially one that is national or regional – a trailer is the perfect vessel. Step vans are popular for consumer packaged goods (CPG) brands, but should really only be used locally because they aren’t built to travel long distances. At Mosaic, I managed a program that utilized a step van for a 15-market national tour and the logistics of that scenario were a disaster. On the initial drive from Chicago to Los Angeles, the truck has to be taken directly to the repair shop to have the brakes replaced. It also could barely top 50 miles per hour, which caused us to increase our travel time from market to market, resulting in fewer activation days and a longer tour than budgeted. A trailer makes far more sense because your tour managers can drop it at their event location and use their tow vehicle to get around. On their days off, they can leave the trailer in the hotel parking lot and cruise around the city. Advantage Trailer has done sampling trailers for brands such as Curate, which utilized a 24-foot stage trailer to sample their granola bars throughout the Midwest, and Popeye’s, which took a 53-foot full mobile kitchen trailer across the country, among others. For the same reasons described above, a trailer makes sense for product demo as well. 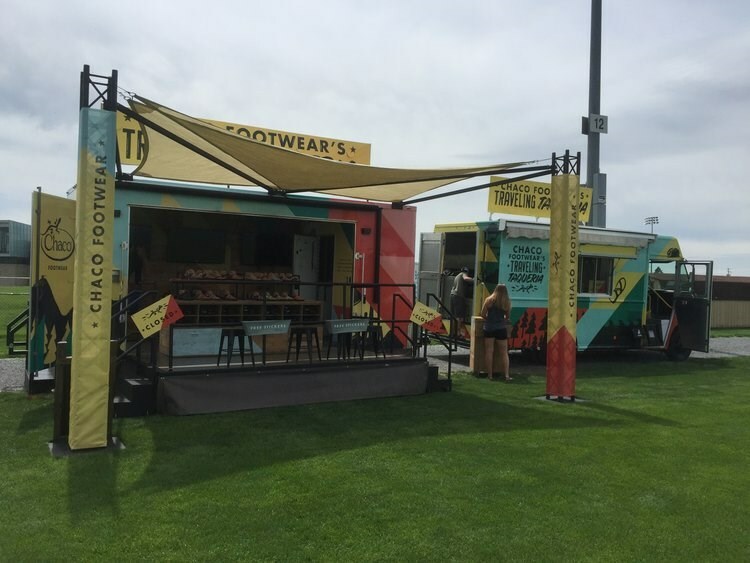 Chaco Footwear turned a 16-foot stage trailer into a mobile fitting room for their Traveling Taqueria Tour, allowing music festival and college event attendees to try on their new line of Chaco sandals. Similarly, we created a mobile fitting room out of a 10-foot pop-up trailer for the French-inspired female clothing line, Basiques. The trailer allows businesswomen on their lunch break to try on clothing, get a full body scan to determine what fits them best, and have those items custom-tailored to order. AT&T and Verizon have both utilized custom trailers from Advantage to demo their products and services to customers at events and outdoor malls, while James Hardie takes their custom pop-up trailer to fairs and festivals to demonstrate their home siding and panels. Perhaps you have a brand that just needs to display product or an item. That’s what Ardbeg did on their The PEAT Hopper Tour. 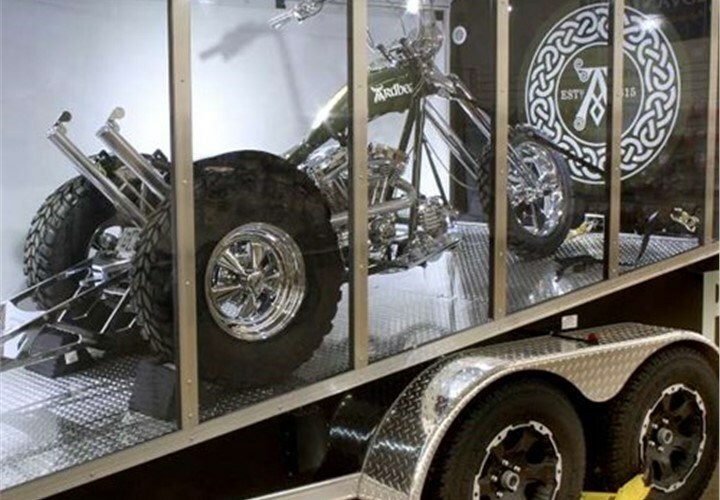 Advantage custom-built a glass-sided trailer to haul Ardbeg’s one-of-a-kind chopper, allowing customers to see it as it traveled from activation to activation. A glass-sided trailer is ideal for showcasing something on the move, but it can also be useful on-site. Let’s say you want to wow event attendees but you don’t necessarily want them to touch it. Instead of using tacky ropes and stanchions, a branded trailer can communicate your brand message and create a higher sense of awe. Another idea would be to use a trailer as a visual focal piece to run a contest at a large music festival. Take one of my former clients, Kettle Brand, for example. They could wrap a clear view product display trailer like a bag of chips with one side open, fill it with chips, and have attendees guess how many are inside for a chance to win. 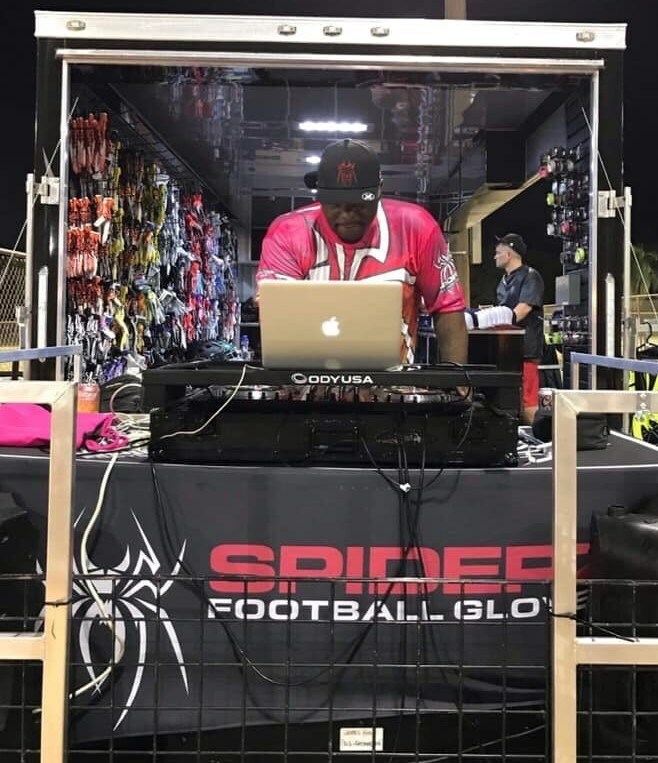 Many experiential programs are starting to incorporate on-site selling into their activations and a trailer makes that easy. Jeanette DesJardins, founder of Car Chix, utilized a 7-foot by 12-foot concession trailer to make her life easier and expand her business. 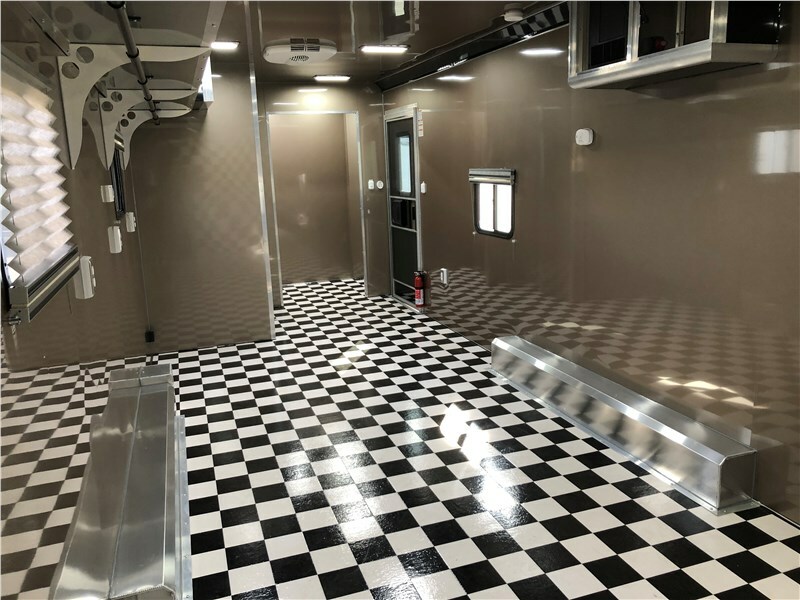 She travels to race and motorsports events across the country promoting women’s interests in the industry and the trailer significantly reduced her setup and breakdown time, while increasing her organization and product sales. 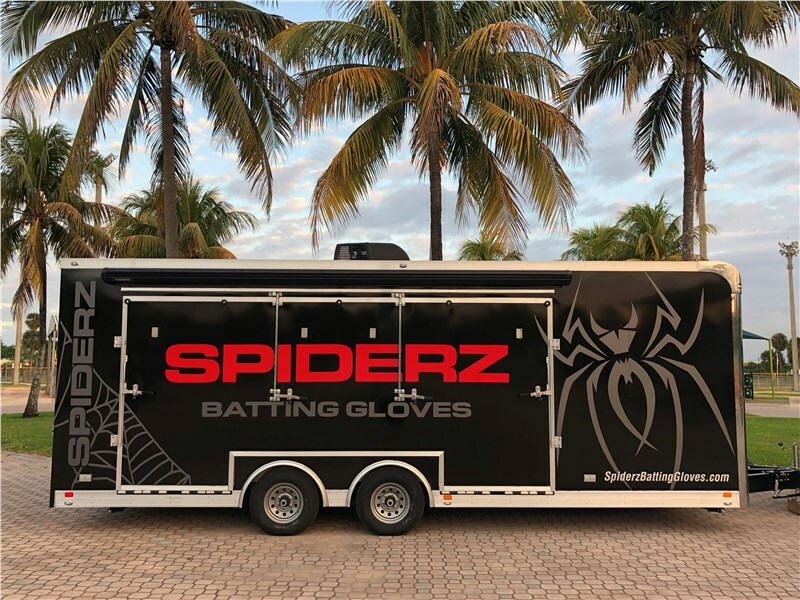 Spiderz Batting Gloves recently launched a tour with a custom-built 24-foot stage trailer that they use to sell batting gloves and other apparel at Major League Baseball stadiums and other baseball and softball events. At their kickoff event in Ft. Lauderdale, Fla. they used the rear fold-down stage as a DJ booth. Whether product sales are the sole purpose of your campaign or just one component of a larger experience, a trailer legitimizes your sales efforts by giving your product a defined and branded space with the look and feel of the brick-and-mortar that consumers are used to. The four uses outlined above are the most straightforward uses of a trailer for marketing purposes, but now let’s take a look at some you may not have thought of. Instead of a pop-up tent, a step-and-repeat, or a difficult-to-set-up modular display, why not customize a trailer to serve as your trade show footprint? Yes, you have the towing costs to get it to and from the show, but you don’t have the labor costs of setting up, and while other trade show vendors are spending hours putting together their booths, you can pull it in, drop it, and hit the town. Last fall, the 3D design, engineering, and construction software company, Autodesk, used a 24-foot stage trailer as the centerpiece of the construction quad at their annual Autodesk University show in Las Vegas. The defined footprint made it easy for attendees to register for sessions, network with others, and receive their swag. 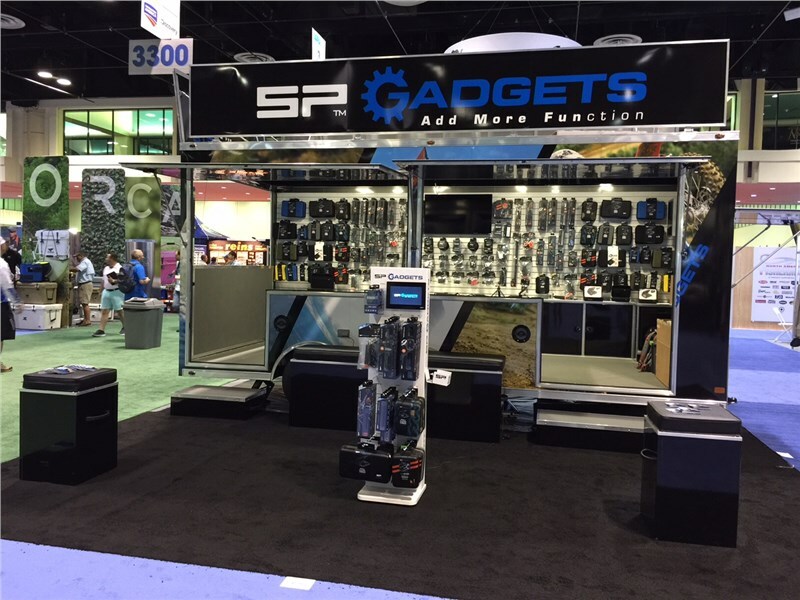 Advantage also custom-built a trailer for SP Gadgets, who used it as their trade show booth to showcase their products. Attendees could enter the trailer and browse the products hanging on the wall, just as if they were in a physical store. A detachable tongue saves space so there is no wasted space in the booth size you paid for, meaning your consumer experience can be customized exactly to the size you need . Does your brand want to educate consumers on an issue, topic, or even your brand history? An educational trailer is a great way to do this. Two years ago we built a custom educational trailer for the Navarre Beach Marine Science Station in Pensacola, Fla. The trailer is equipped with several fish tanks that allow kids to interact with marine animals and vegetation at local festivals. Branding around the trailer provide educational messaging about the marine ecosystem and the impact humans have on it, providing the staff great visuals to teach from. Similarly, the Atlantic City (NJ) Aquarium invested in a trailer that now serves as their Traveling Touch Tank. 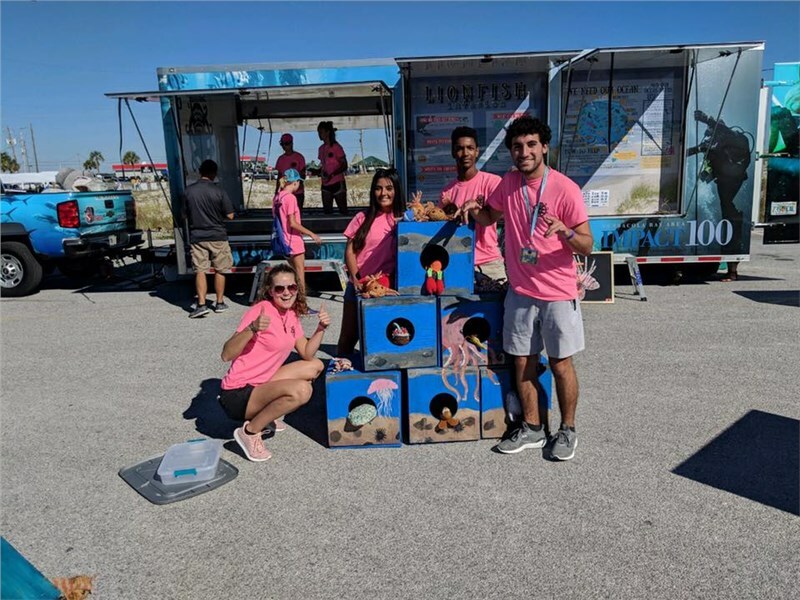 They bring it to schools, festivals, community events, and corporate gatherings, allowing kids and adults alike a hands-on experience with stingrays, crabs, bamboo sharks, and more. The National Museum of the Pacific War recently commissioned Advantage Trailer to custom build a trailer, which now serves as their Mobile Education Center in Fredericksburg, Texas. All three of these examples are outside the box ideas by an industry that is typically thought of as stuffy and stuck in its ways. Instead of sitting back and waiting for customers to come to them, these museums are using custom trailers to take the education directly to where people work, shop, and play. In today’s political climate many brands are wading into support of issues on both sides of the aisle, looking for causes to align with their brand, or simply using their influence to help those in need. Take Budweiser, for example. The beer industry giant regularly responds to natural disasters by converting some of its production plants to canning water for those in affected areas. Or Tide’s Loads of Hope program, which takes clothing donations and donates them to those who lost everything in a natural disaster. A trailer allows brands to serve those in need. In 2017, we put together a mobile laundromat full of LG washing machines and dryers. In this case, it was bare bones but LG had us build it strictly to serve a purpose: to give those affected by the flooding resulting from Hurricane Harvey a place to wash their clothes. 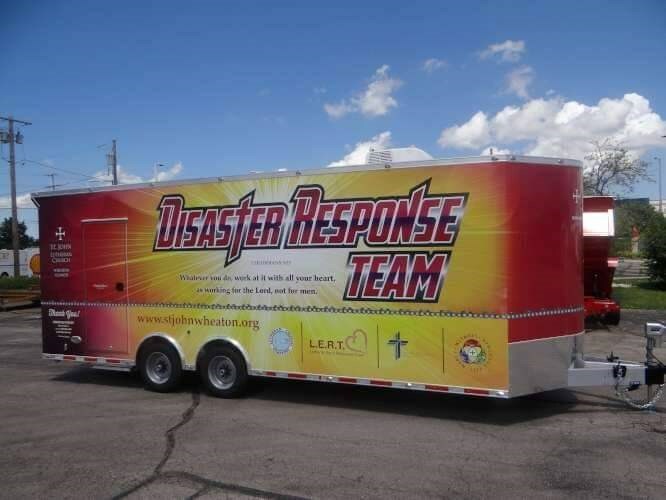 We have also done several disaster response trailers for churches and other groups across the country, allowing them to quickly respond when natural disasters strike. Incorporating a corporate social responsibility piece into your next marketing program is just a smart thing to do because it allows your client’s brand to help others and gain some positive publicity in the process. Food trailers can range anywhere from a small 6-foot by 10-foot concession trailer to a 53-foot full mobile kitchen. Likewise, they can have a number of uses for experiential marketing programs. The most obvious would be to serve your brand’s food or drinks. We’ve done mobile bars, which would be perfect for Bud Light, Miller Lite, or other beer brands to serve drinks at festivals and events. We’ve also done several mobile barbecue trailers like Bub City’s The Rig and the Lillie’s Q competition trailer, which allow them to cater and serve their food at private and public events or compete against the best in the world. Last fall, one of our clients launched a 48-foot food trailer in Austin, Texas that features a full rotisserie-focused restaurant on the front and a sauce tasting bar on the back. His business model is to feature up to 14 different sauces from independent sauce makers across the country, allowing consumers to try free samples, and if they like, purchase bottles on-site. But what if your brand isn’t a food or beverage brand? How could you utilize a food trailer? The best answer is another question: How creative are you? How about incorporating a concession-style coffee trailer or ice cream trailer into your event? Or a taco trailer like Chaco’s Traveling Taqueria, which had nothing to do with footwear, but offered festival attendees something everyone loves – tacos! Really, you’re only limited by your imagination when it comes to utilizing trailers as part of your activation. Even if you aren’t an alcohol brand, a custom mobile bar trailer can enhance your owned event in a way that your run of the mill portable catering bar can’t. If you’re not a food or beverage brand, a CPG brand, or an apparel brand, there are still ways to employ a trailer for marketing purposes. We are currently fabricating a custom trailer that will serve as a mobile lash bar, allowing a stylist to perform hair, eyelash, and other cosmetic services, including tattoos, for customers without being tied to a physical location. The same could be done for, say, Procter & Gamble’s health and beauty products. 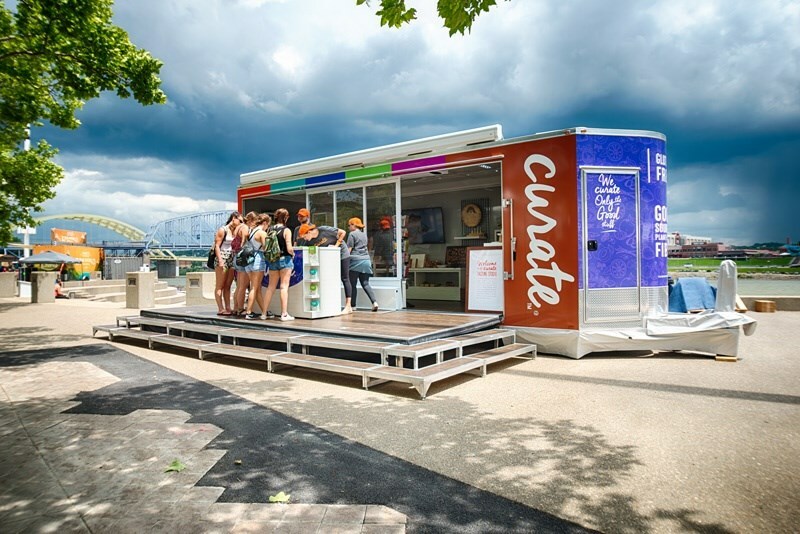 A custom trailer in which customers at a festival can get their hair washed with Vidal Sassoon, or a free dental checkup and cleaning with Crest, or a mobile barber that provides free shaves with Gillette products would be a great way to allow consumers to experience the product in an engaging way on their terms. Finally, a trailer can be a perfect solution for performances. One of the three main types of marketing trailers we offer is a stage trailer, which ranges from 16 to 48 feet depending on your needs. Liven up your next event with a DJ booth inside a branded stage trailer. Or if you are hiring a band, a larger stage trailer can accommodate a full band. One of our customers did just that for his traveling road show. We also recently completed a mobile magic trailer for a magician in Virginia Beach, Va. that he can take to schools, parks, and corporate events to entertain. If you are overseeing an owned event, lease a stage trailer to serve as the attention-grabbing performance space for your DJ or live band. Or, if your live band requires a traditional stage, deck out a trailer with comfortable furniture to serve as the artist’s green room. As you have seen throughout this post, there is no shortage of ways a trailer can be used for experiential marketing purposes. The biggest benefit of all is that a trailer is mobile, allowing your brand to move from event to event or market to market and replicate the same experience for a different consumer group. Even if you don’t have a national tour, a trailer simply provides flexibility and options. If you don’t want to purchase a trailer, Advantage Trailer offers leasable marketing trailers, giving you the benefits of a trailer without the storage and maintenance costs associated with owning one. By working with Advantage Trailer, you not only get a family-owned and operated small business that has been selling and customizing trailers for 30 years, you also get a marketing agency veteran to help guide you through the process. That combination is something no other trailer dealer/fabricator can offer. We take great pride in helping our clients build their dream, whether for personal use or to bring their client’s brand to life. If you have any question about whether or not a trailer would work for your situation, we can talk you through it. Call 630-524-2029 to speak with one of our trailer experts or email marketing@advantagetrailer.com for a quote today.